Brachycephalics are animals that have very shortened and compressed muzzles and heads leading to difficulty in their ability to pass air through their breathing passages. It is a compilation of conditions that includes some or all of the following: stenotic nares (small nostrils), collapsed nasal passages, elongated soft palate (excessive tissue in the back of the throat), everted laryngeal saccules (tissue within the voice box) and eventually laryngeal collapse (collapse of the voice box). Are Dogs Born with Brachycephalic Syndrome? The animal is born with the tendency to have the stenotic nares, collapsed nasal passage, elongated soft palate and occasionally a narrow trachea. 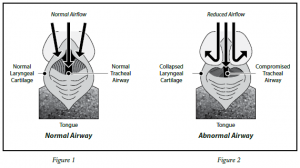 However, prolonged breathing through this tight narrow passage elevates the pressure in their head and throat causing the secondary effects of thickening of the back of the mouth (excessive pharyngeal folds) and laryngeal collapse. 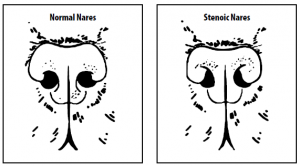 What Specifically are Stenotic Nares? The cartilages of the nose openings are too thick and narrow thereby obstructing normal inhalation of oxygen. Figure 1. What is a Long Soft Palate? The soft palate is a continuous muscle in the back of the throat separating the nasal passages and the mouth. If it is too long, the tip of the muscle extends into the pharynx/larynx causing obstruction to airflow. Figure 2. What is the Consequence of Breathing this Way for a Long Time? As the dog continues to breathe against this excessively high pressure, the soft tissues become thicker and longer. The pharyngeal folds develop narrowing the breathing passage; the tonsils become more prominent and further close down the airway; and the larynx starts to collapse. The amount of pressure needed to breathe is too intense and the cats and dogs suffocate because of inability to pass air through their nose or mouth. How do I Know my Dog or Cat Has Brachycephalic Syndrome? They have noisy breathing, especially during respiration. They may retch/gag, have exercise intolerance, can turn blue from a lack of oxygen, and even pass out. Periods of over activity, excitement, heat and humidity are most problematic for these patients. Some of these cats and dogs will actually sleep sitting up or on their backs as it positions the soft palate out of the way. Is Anesthesia Really that Bad for These Particular Dogs and Cats? Anesthesia is always a risk; however, anesthesia at MedVet is supplied by staff trained by and under the guidance of a board certified veterinary anesthesiologist or surgeon. These cats and dogs are expected to do well while under anesthesia; however, the recovery period for these patients is particularly important. Close patient monitoring; gradual/ comfortable recovery and excellent postoperative nursing care are all critical aspects of a proper recovery from anesthesia. How Does MedVet Make the Diagnosis? Examination of the airway/ throat is difficult in an awake dog. Although the veterinarian will be highly confident of the diagnosis just based on the breed, the history and the clinical signs (symptoms), a sedated oral examination is necessary to assess the airway thoroughly. This examination can be done on an appointment basis but is generally done just as the procedure is started for treatment. How do I Know if my Dog or Cat Needs Treatment? Patients that experience breathing distress, worsen during excitement and exercise, have difficulty sleeping and eating are treatment candidates. However, occasionally, especially in warmer months, a patient may have a more acute life-threatening situation that requires emergency surgery. The first step in treatment is removal of the elongated soft palate with either scissors or a laser. Both techniques have pros and cons and surgeon preference will be discussed during the consultation. Will my Dog Breathe Quietly After Surgery? Although the palate is partially removed, the majority of cats and dogs will continue to have some degree of snoring and snorting noises. What Risks are Involved With Palate Removal? Risks include but are not limited to bleeding, swelling, possible fire with the use of laser, and possible need of emergency postoperative tracheostomy tube placement. However, more common complications are postoperative swelling, continued breathing noise and pneumonia. How are the Other Problems Treated? The second step is to remove any eversion of the laryngeal saccules. Usually only minor bleeding occurs and is typically not much concern. How is the Nose Treated? These narrow nose openings will either be removed (widened) with a scalpel and sutured together or removed with a laser. Again, both techniques have pros and cons but the shared goal is to open the holes as wide as possible to provide the greatest amount of air intake. Risks with this procedure include bleeding, premature suture removal, scabbing and crusting and temporary loss of some pigment in the nose. They will go home with an e-collar to prevent scratching the sutures out. Will a Temporary Tracheostomy Be Necessary? Rarely and is only necessary if the dog is in severe respiratory distress from severe swelling in the back of the throat. Generally, this swelling will resolve in a short time but in that time period, your surgeon may have to place an emergency tube into the neck trachea (windpipe) to bypass the swollen breathing passage of the mouth. Usually within 48-72 hours enough swelling resolves so the tube can be removed. How Long Will My Dog Be at MedVet? We generally keep our patients for about 24 hours postoperatively to closely monitor them for swelling and pain. What do I Expect Postoperatively? Coughing and gagging are common. Your dog or cat will essentially have a “sore throat” after surgery. The pain medications are dispensed to help with this and most cats and dogs will appreciate a soft diet for the first week until the soreness resolves. What is the Prognosis with Brachycephalic Syndrome? The prognosis is generally very good, especially for the young, cats and dogs that have less severe progression of airway dysfunction. 85% of the cats and dogs are expected to improve significantly following surgical treatment. They may still breathe noisily and snore, but they should be able to handle stress, heat and activity much better. You can expect an increase in their activity and energy levels and their ability to exercise. Older animals may have less success with surgery, because the long-term progressive changes they experience produce pharyngeal folds and laryngeal collapse. While treatment is slightly less rewarding with this severity of conditions, it is still indicated.